Dental bridges are used to replace missing teeth. The actual restoration is made from a false tooth (pontic) that is fused to a covering (or crowning) over one or both neighbouring teeth. 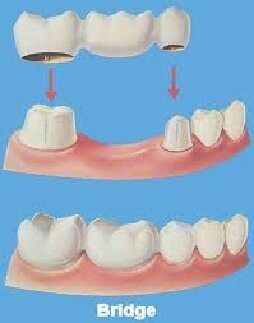 The most commonly used dental bridge is a traditional fixed bridge. Bridges can be used to replace one or more missing teeth, helping to restore function to the mouth and improve smile aesthetics. The type of bridge chosen will usually be dependent on the location of the missing tooth. Maryland bridges are mainly used to replace a missing front tooth and cantilever bridges are often employed in cases where there is a healthy tooth on only one side of the gap. Bridges can be made from different materials including precious metals, porcelain and porcelain bonded to metal. Porcelain is a particularly popular option because it produces more natural aesthetics. Why Would I Need A Dental Bridge? 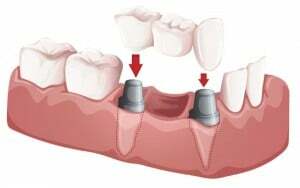 You may need a dental bridge if you have lost a tooth or are to have a tooth extracted. It is always a good idea to replace missing teeth because gaps can affect the function and look of the mouth. Tooth gaps can cause the remaining teeth to start moving out of position (drifting), also contributing to an increased risk of tooth decay and gum disease. This is due to the fact that the empty tooth sockets tend to attract bacteria. Replacing missing teeth enables you to eat properly and talk clearly. It will also help to improve the look of your smile and the general aesthetics of your face, as the teeth are responsible for supporting the lips and cheeks.